Bleeding disorders: Serrapeptase might interfere with blood clotting, so some researchers worry that it might make bleeding disorders worse. If you have a bleeding disorder, check with your healthcare provider before using serrapeptase. Surgery: Serrapeptase might interfere with blood clotting. There is a concern that it might increase bleeding during and after surgery. Stop using serrapeptase at least 2 weeks before a scheduled surgery and for at least 2 weeks after. Blood Clotting: Serrapeptase might decrease blood clotting. Therefore, taking serrapeptase along with medications that also slow clotting might increase the chances of bruising and bleeding. Some medications that slow blood clotting include aspirin, clopidogrel (Plavix), diclofenac (Voltaren, Cataflam, others), ibuprofen (Advil, Motrin, others), naproxen (Anaprox, Naprosyn, others), dalteparin (Fragmin), enoxaparin (Lovenox), heparin, warfarin (Coumadin), and others. Serrapeptase is a proteolytic enzyme isolated from the micro-organism, Serratia E15. This enzyme is naturally present in the silkworm intestine and is processed commercially today through fermentation of plant grown enzymes suitable for vegetarians. This immunologically active enzyme is completely bound to the alpha 2 macroglobulin in biological fluids. Histologic studies reveal powerful anti-inflammatory effects of this naturally occurring enzyme. Digests non-living tissue, blood clots, cysts, arterial plaque, inflammation, internal scar tissue and may help some external scars particularly if new; any residues are either converted into amino acids or excreted in the normal manner. Chronic inflammation lies at the root of many health problems; Serrapeptase helps to resolve this in a natural and balanced way. Some people find that their symptoms disappear within just 1-2 weeks, but we generally recommend a course of 3-4 months and then reassess your needs. Certain health conditions may benefit from a long term maintenance dose of just 1 tablet per day. There are numerous health conditions that have benefited from the use of Serrapeptase listed at the end of this article. Serrapeptase has had wide clinical use, spanning over 30 years throughout Europe and Asia. In Germany and Austria, Serrapeptase is available on prescription. Millions of doses have been taken worldwide with no side-effects. It can be taken alongside any other medications, and may reduce or completely eliminate the need for commonly prescribed synthetic drugs. It is safe during pregnancy, for children and has also been used very successfully with pets. Serrapeptase is a viable, natural alternative to salicylates, ibuprofen and the more potent NSAIDs. Unlike these drugs, Serrapeptase is a naturally occurring, physiologic agent with no inhibitory effects on prostaglandins and is devoid of gastrointestinal side effects. The late German physician Dr. Hans Nieper used Serrapeptase as a treatment for arterial blockage in his coronary patients. It protects against stroke and is reportedly more effective and quicker than EDTA Chelation treatments in removing arterial plaque. He also reports that Serrapeptase dissolves blood clots and causes varicose veins to shrink or diminish. Dr. Nieper told of a woman scheduled for hand amputation and a man scheduled for bypass surgery who both recovered quickly without surgery after treatment with Serrapeptase. It is a natural anti-inflammatory and as a strong protease can dissolves the dead proteins that bind the plaque blocking the arteries. Serrapeptase does not thin the blood, but simply makes it healthier by stopping the chronic inflammation. Serrapeptase is a natural product that can be taken safely in both the short and long term and will not interfere with other medications, no side effects have been found in any of the huge number of studies and clinical trials - in some cases people have taken 30 capsules a day with no ill effects. See Cautions below. I informed you some years ago that Serrapeptase is apparently active in the cleaning of coronary arteries from occluding layers. The results are so spectacular that even Tom Valentine reported on this progress in the US (DC) press after speaking to several parties here. Serrapeptase is an enzyme produced by serratia bacteria living on silkworms. With this enzyme the worms melt a hole out of the cocoon. Unlike other enzymes in the field of biology, Serrapeptase dissolves ‘dead’ tissue like or e.g. not both silk and apparently also fibrinoid layers in the arteries which chemically could be compared to silk. A special problem in today’s civilized society is occluding processes in the carotid arteries of the neck. Very often we see patients where surgeons were reluctant to operate or to apply drill or laser technology such occluded carotids. The reason for this is the potential risk that off coming debris will be pushed into the smaller cerebral vessels. We have, therefore started to apply Serrapeptase in cases of severe narrowings of the carotid arteries. Mostly in patients showing severe symptoms due to the narrowing, including amaurosis fugax (intermittent blindness). The therapeutic results are excellent, certainly lifesaving. It is, however, mandatory that the therapy be conducted for a very long time. The first reliable results can be expected after 6-8 months. Even after month 18, after the onset of the therapy, the patients are improving. I have also found Serrapeptase to be an extraordinary substance for safety removing fibrous blockages from coronary arteries, particularly the carotid arteries found in the neck, which supply blood brain. 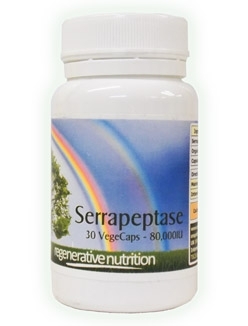 Serrapeptase is a natural enzyme produced by serratia bacteria living in silkworms. Once the silkworm has completed its transformation into a moth, it uses this substance to "melt” a hole in its cocoon, so that it can escape. The astonishing fact is that, unlike other biological enzymes, Serrapeptase affects only non-living tissue, like the silk cocoon. This is the reason the butterfly is not harmed. For our health purposes, Serrapeptase dissolves only dead tissues such as the old fibrous layers that clog the lining of our arteries and dangerously restrict the flow of blood and oxygen to the brain. Because of this, Serrapeptase is extremely useful in keeping arterial deposits from building up again after angioplasty (a balloon technique used to clear an artery blockage) or coronary bypass surgery has been performed. Very often, surgeons are reluctant or unable to open partially closed carotid arteries using laser surgery. They fear that resulting debris could be pushed into smaller connecting arteries and result in a stroke and possibly death. In cases of severe arterial narrowing, I have used Serrapeptase with excellent, even life-saving results. Many of my patients have shown significant improved blood flow through their previously constricted arteries, as confirmed by ultrasound examination. Unfortunately, orthodox cardiologists do not employ this important method in their practices. Blood Thinning and Interactions: If using medications such as Warfarin, which thin the blood and are dose dependant, correct dose and reaction should be monitored. Serrapeptase will potentate Wafarin, making the need for dose dependant reactions in greater need of monitoring. Many natural remedies and dietary improvements will thin the blood naturally, so you can make your own decision on whether to use pharmaceutical drugs or nutrients in conjunction with blood thickness tests that your Doctor may provide. Serrapeptase does not act like a drug to thin the blood whether the blood needs to be thin or not, but only thins the blood if it is already too thick due to platelets sticking together and general protein based debris that needs clearing from the system. Serrapeptase makes the blood healthier by clearing this debris and dead blood cells.